Allan Block makes it easy to draw your fence panels. 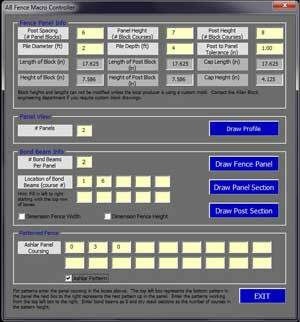 The AutoCAD Fence Macro allows you to configure your patterns to fit any project requirements. It helps lay out multiple panels, detailed panel drawings, panel sections, and post sections. Download the Allan Block Fence Macro for AutoCAD to quickly lay out standard pattern and Ashlar pattern fence designs. Open the .ZIP folder by double clicking the folder. Drag the files to the desired location on your computer. Right click on the .ZIP folder and select Extract All. Follow the prompt to save the files in the desired location. Use a third party application to extract and save the files in the desired location. Once the files have been saved in the desired location, open the AB Fence Macros instructions for further information on how to install the files within your AutoCAD program.